When April 1 arrives in a little more than a week, Mazda Canada (MCI) will have a new president and chief executive officer in place. It’s a move that marks the first Canadian to be appointed president of Mazda Canada since 2006. MCI recently announced the appointment of David Klan to this position. Klan will succeed Masaharu “Massey” Kondo, who has been promoted to general manager of the global sales and marketing division at Mazda Motor Corp. (MC) in Japan. According to a news release, Klan assumes responsibility for Mazda’s business operations in Canada and will report to Masahiro Moro, Mazda Motor Corp. senior managing executive officer with oversight of operations in North America and chairman and chief executive officer of Mazda North American Operations. Since returning to Canada in 2009, Klan has led the company's national sales, marketing and regional operations as senior director. “I’m honoured to assume the role of president of Mazda Canada and serve our great team of employees and dealer partners,” Klan said. “Mazda is entering an exciting period as we launch our new generation of vehicles, and the North American market will play a pivotal role in Mazda’s global strategic plans. “I look forward to leading Canada's charge during this important time,” he added. Following recent national product advancements, TRADER Corp. has added two new people to its advertising team to assist with its latest digital technology growth. TRADER has announced that it has brought on Korie Weston and Stuart Staves to fill newly added specialty roles that support several national product enhancements geared at helping dealers and OEMs successfully deal with an evolving automotive digital landscape. TRADER said that Weston has been chosen to serve as TRADER’s national programmatic executive. And Staves has been brought on to assist with branded content and social as a management consultant for the company. Weston brings programmatic advertising expertise and experience in sales. She has spent time at Rogers Media and leading programmatic efforts at Zenith. In her new role, Weston will lead TRADER’s programmatic space and develop a trading environment where agencies and OEMs can access autoTRADER.ca's audience through multiple channels, according to the company. Meanwhile, TRADER said that Stuart comes to the company with experience working within business development and branded content revenue for Nike, Microsoft and Unilever. “He will be a great asset in introducing OEMs to more growth opportunities in the digital environment,” McMinn said. Kijiji Canada announced Monday that it has grown its leadership team with three leadership position appointments of three folks who have been named in Auto Remarketing Canada's Remarketing's Under 40 — two from this year and one from 2015. The company announced Monday that it has named Will Harris the national head of sales, autos; hired Rohit Jaitley to serve as national head of dealer groups; and hired Robert Karbaum to serve as head of business development. “We’ve got lots of exciting advancements coming to the autos vertical and ensuring that our team is stacked with the right people to lead what’s to come is crucial to our success,” Kijiji director of autos Leanne Kripp said in a news release. “Each person brings incredible experience and passion to their roles. “I’m confident they will continue to strengthen the relationships between both our internal teams and our valued customers and partners. I couldn’t be more thrilled to welcome these respected industry leaders to the Kijiji family,” said Kripp. Harris, who was recognized in Auto Remarketing Canada's Top 40 Under 40 this year, most recently served as Kijiji national dealer group manager. In that role, he created a team of key account managers to serve as advisers and advertising experts to dealer groups in Canada. Meanwhile, Jaitley, who was also named a Top 40 Under 40 leader by Auto Remarketing Canada this year, brings 10 years of experience in automotive digital sales and marketing. He comes from Leggat Auto Group, where he served as digital marketing manager. In addition to cultivating partnerships with Canada's dealer groups, as national head of dealer groups, Jaitley is responsible for molding and leading the Kijiji Canada national dealer group team and its strategy, according to the company. Karbaum was recognized in 2015 as a Top 40 Under 40 leader by Auto Remarketing Canada when he held his most recent role as national digital strategy manager at Dilawri Group of Companies. At Kijiji, Karbaum has been tasked with building and executing the company’s commercial growth strategy. With a focus on autos, the company said that he will pinpoint opportunities with strategic partners and establish the sites long-term partnership plan across its vertical categories. Mercedes-Benz Canada announced Wednesday that Mercedes-Benz USA’s Andrew Noye will come aboard as the company’s new vice president of sales, effective Oct. 1. In addition to overseeing corporate sales and remarketing, Noye will also head the company's new car and pre-owned divisions and report to Mercedes-Benz Canada president and chief executive officer Brian Fulton in his new role. Meanwhile, Noye is transitioning from his current role as MBUSA regional general manager of the Southern Region. While at MBUSA, he has been based in Jacksonville, Fla., where he is in charge of overseeing service, sales, marketing and franchising for Mercedes-Benz dealer operations in the Southern U.S.
“I am very excited to be welcoming Andrew to Mercedes-Benz Canada. Fulton said in a news release. “There is no doubt that we will benefit from his knowledge and expertise: Most recently, he has overseen the activities of 118 dealers in MBUSA’s largest region, with truly impressive results. “Not only that, his extensive experience working with MBUSA's dealer network means he is well-positioned to make valuable contributions to our customer-centric culture,” Fulton continued. Prior to his most recent MBUSA role, Noye has previously held a variety of high-level management positions in different regions of the country, according to Mercedes-Benz Canada. In fact, he first joined MBUSA in 2003 as Western Region market manager in California, the company said. Following a few moves on its board of directors this spring and into early summer, AutoCanada announced on Tuesday the appointment of Michael Rawluk as group president, as well as the resignation of senior vice president and chief operations officer Mark Warsaba. AutoCanada said that it thanks Warsaba for his years of service. Rawluk joins the group, following his most recent role as chief operating officer of Birchwood Automotive Group's 22 dealerships in Winnipeg, Manitoba. In his new role, Rawluk will head AutoCanada dealership operations, in addition to other related business intelligence, marketing and human resources functions, according to the group. “We are delighted to welcome Michael to AutoCanada,” AutoCanada board chairman Paul Antony said in a news release. “AutoCanada has rapidly grown since its founding, and we will continue to selectively acquire stores that fit our criteria for excellent performance and enable us to further diversify our brand portfolio and geographic reach. However, the company has yet to attain its goals for superior operational performance and Michael will help us build out the operational muscle within AutoCanada. “We look forward to seeing Michael's proven track record in managing a large and diversified group of dealerships translate into operational excellence for AutoCanada,” said Antony, the former CARPROOF CEO who was named AutoCanada board chair last month. A new vice president is now in charge of implementing the ADESA Canada dealer sales strategy, ADESA, a business unit of KAR Auction Services, announced Wednesday. The company has chosen Steve Langdon, who has already spent 15 years at KAR, to serve as ADESA Canada VP of dealer sales. Langdon was most recently senior director of business development at ADESA and OPENLANE. In addition to discovering new growth opportunities, in that role he was responsible for fully integrating additional ADESA services into new and subsisting business relationships such as ADESA Data as a Service. “We didn’t have to search far to find our new leader of dealer sales at ADESA Canada. Steve Langdon started with the KAR family 15 years ago and has more than 20 years of automotive industry experience,” ADESA Canada chief operating officer Trevor Henderson said in a news release. Furthermore, Langdon brings sales team leadership skills, as well as expertise in digital channels that can help further advance KAR integrated digital, mobile and physical auction services ADESA online and TradeRev. “He brings a strong background in new auction technologies, a wealth of industry knowledge and many very strong relationships throughout the industry that will result in a smooth transition for our customers,” Henderson added. Additionally, ADESA said Langdon has also grasped extensive bilingual skills that can be instrumental when connecting with sales teams throughout Canada in his new role. Prior to joining KAR, Langdon was as a bilingual service adviser with Groupe Samatas at Excel Honda in Montreal. Within the next 12 months, Canadian automotive dealers say that they mostly need to fill positions in service, sales and leasing, and just about 45 percent plan to fill six to 20 positions, according to a nationwide survey. Just about 84 percent of Canadian dealers told the Canadian Automobile Dealers Association (CADA) that they are looking to hire service technicians, in a survey on dealership human resource demands and hiring projections associated with the new Auto Career Start program recently launched by CADA. According to CADA, 70.5 percent of the same group of dealers revealed that they’ll be hiring for sales and leasing positions, and dealers also shared the need to fill positions in management, parts and service, administration, accounting, marketing, IT, finance and HR, as well. “The survey reveals what we have been hearing anecdotally: that dealers across Canada will need to fill a variety of positions over the next several years, and in some cases, the need is already critical,” CADA marketing specialist Astrid Mauger said in a news release. “Dealers across Canada are actively looking to hire and will be continuing to hire in large numbers in the foreseeable future. “Our message is clear: Whether you are a recent graduate or have previous work experience, consider applying for a position at an auto dealership – a workplace which offers stable, well-paying jobs and in need of fresh talent to meet its growing business opportunities,” Mauger continued. Along with the survey results illustrating that 44.7 percent of dealers plan on hiring six to 20 Canadians within the next 12 months, of the dealers surveyed, 99.5 percent plan to fill at least one to six positions, and close to five percent plan on filling more than 20 positions throughout the next year. Additionally, in conjunction with the recent launch of its nationwide Auto Career Start program, CADA also recently introduced a new online platform that lists hundreds of jobs and auto career resources at what is recognized as the largest outdoor, student-run auto show in Canada. CADA officially introduced its Auto Career Start program’s autocareerstart.com website, which is designed to specifically target millennials, women, new Canadians and military veterans, at The Georgian Auto Show, according to the association. CADA said that the program is designed to promote varying positions open at more than 3,000 new car and truck dealerships throughout Canada. “The auto sector is experiencing tremendous growth, and as a result, dealers across Canada are in immediate need of new talent to fill a variety of full-time positions – related to marketing, administration, IT, sales, parts, service and management,” said Mauger. In addition to The Georgian Auto Show, as part of the Auto Career Start program launch from Sunday to Thursday, CADA supported the Skills Canada National Competition (SCNC) held in Edmonton, Alberta as its official Youth Engagement Partner. More than 500 students and apprentices at SCNC competed to become champion in their respective discipline to obtain a place on WorldSkills Team Canada, according to CADA. The association explained that students can compete in one of 44 skill areas, including several that relate to positions at auto dealerships in marketing, administration, IT, sales, parts, service and management. 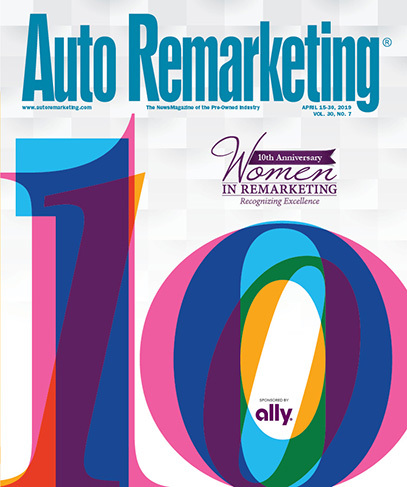 The International Automotive Remarketers Alliance announced this week a new Canada Committee co-chair. Chosen for the IARA Canada position is Eric Janca, lease maturity and remarketing manager at SCI Lease Corp.
Janca was also a speaker at the Auto Remarketing Canada Conference earlier this week in Toronto, and offered analysis on insights and intel impacting the remarketing and pre-owned industry today. In this position, Janca will be taking the place of John Paonessa, vice president of remarketing solutions at GM Financial, as he steps down from his co-chair responsibilities. IARA Canada shared that Paonessa will remain on the IARA board of directors. “John has been in the co-chair seat for numerous years and has decided that it is now the right time to step back and hand over [the position] responsibilities of the Canadian co-chair lead to another consignor,” said Richard Pasta, national manager strategic accounts at CarProof. Pasta also currently serves as a Canadian Committee co-chair, and will remain in the position for the foreseeable future. “There have been a lot of changes that have happened with the IARA Canadian Committee and the subcommittee Leads. We’ve have also seen a restructuring and resurgence of the subcommittees with a lot of great talented people being engaged, and I am excited on the direction the IARA is heading in Canada,” said Paonessa. In addition to the announcement of a new co-chair, the IARA Canadian Committee also shared that Lori Murtagh, chief risk officer at SCI Ltd., will take on the newly appointed second Canadian seat on the IARA board of directors. Murtagh was also honored at the 2017 Women & Automotive Canada Leadership Forum as a Profiles in Leadership honoree. Kijiji Canada recently announced that it has appointed Darryl Hilton to serve as the national head of automotive sales. Hilton brings 20 years of experience from both the supplier and retail sides of the automotive industry, and he has also specialized in the management of pre-owned programs, the company said. Most recently, he served as national manager of pre-owned and fleet at Infiniti Canada, where he lead the development and implementation strategy for the launch of the new certified Infiniti program. In his new role, the company said Hilton will be instrumental in both the internal and external growth of the Kijiji autos team across Canada. “I’m excited for the challenge this new role will bring, and the leadership focus it will allow me to take within the existing Kijiji Autos team,” Hilton said. “Together, we’ll help build simple but effective sales solutions to improve Kijiji’s business offering and the overall customer experience. I’m excited to work with such a strong and motivated team as we take Kijiji in this new direction, and continue to build meaningful, effective relationships with dealers and our partners,” he continued. In addition to leading the development of the company’s expanding sales team, Hilton will also serve as a trusted partner to dealers by helping them gain market exposure, generate high-quality leads and deliver on strong returns on investments, according to Kijiji.